Sbscustoms - Kerrville, TX 78028, USA Don't be a fool! 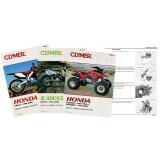 "Look, if you ain't got no Clymer manual fer yer ride then you need one. One of the best tools for a garage hooligan." slipperpickerel - utah clymer service manual "A must have lots of tips I would never have thought of rebuilt my top end was first engine I ever took apart"